After deleting a file from a project (from the project file window), the file list collapses, and shows only the "root" node, so I have to press the '+' in order to see the list again. Is it a bug? or can it be modiferd? 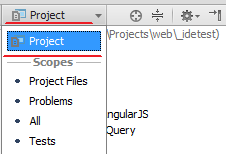 2) I see that you are using "All" scope in Project View. Does issue present when using "Project" scope? I can be wrong here, but I think it's pretty much the same as "Project" (at least I do not notice any diff on my projects).